Preheat oven to 350° F. Place cake mix, eggs, water, oil and pudding mix in a bowl. Blend on medium for two minutes. Grease a jelly roll pan with cooking spray. Pour batter on the pan and spread evenly. Bake for 18 to 22 minutes, or until the top of cake is golden brown and a toothpick inserted in the center comes out clean. Let cake cool completely. Cut out circles of cake with circle cutter and place them on a baking tray. Stir food coloring (if using) into frosting until desired shade is achieved. Working with half of the frosting at a time, scoop into disposable decorating bag or zip-top bag. Twist and secure top of the bag with a rubber band. Snip 1/2 inch from tip of the bag. Pipe circles of frosting on each of the cake circles, sprinkling with sprinkles as you go along. Prepare skewer sticks. 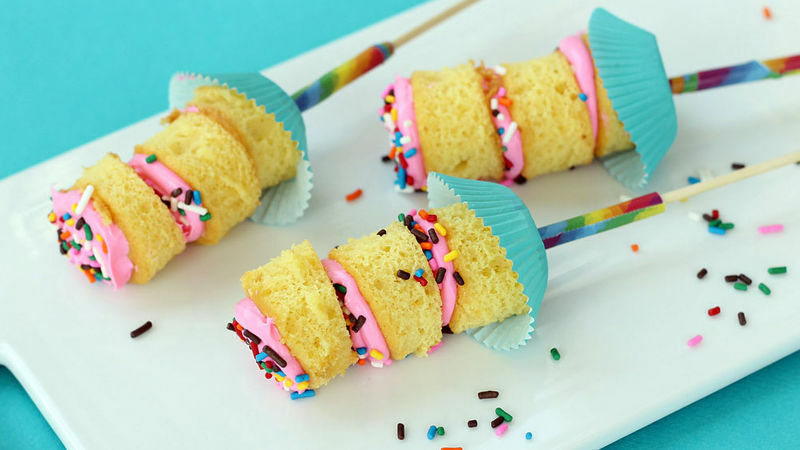 Skewer a mini cupcake liner and slide to the top of the stick. Take a 5-inch strip of duct tape and wrap around the stick 2 1/2 to 3 inches from the top. Rest the cupcake liner on top of the duct tape. Hold a circle of cake at sides and slide on stick, pushing down to cupcake liner. Slide 2 more circles of cake onto skewer. Place kabob on its side on a baking tray and finish assembling the rest. Store in refrigerator until ready to serve. When in doubt about what to make for a fun party dessert, go with “on a stick”. Every time. These birthday cake kabobs are an eye-catching twist to the traditional cake-in-a-pan, and you don’t need to be an expert decorator to make them. If you’ve tried to put cake on a stick before (and not in cake pop form), you might know the struggle of keeping the cake from sliding under the weight of the frosting. Well, tricking out the sticks solves that problem, and it takes mere minutes to do! You can buy pretty much everything you need at the grocery store. If you don’t have the circle cutter, you can find that at the craft store. You’ll also need duct tape and cupcake liners. These should be at the grocery store, too, but you’ll find a greater variety of colors at the craft store. Start by making your cake. So the cake is a bit denser, and thus better for the stick, we’re going to change up the recipe and go with the pound cake version. Preheat the oven to 350 degrees F. Then place the cake mix, eggs, water, oil and pudding mix in a bowl and blend well for two minutes. While the cake is mixing, prepare a jelly roll pan. (They’re the baking trays with edges, not the flat cookie sheets.) Spray the entire pan with cooking spray. When your cake is all mixed, pour the batter onto the pan and spread evenly. Bake for 18 to 22 minutes, or until the top of the cake is golden brown and a toothpick stuck in the center of the cake comes out clean. Let the cake cool completely. Next, cut out your circles. Use the cutter to cut the circles close together to maximize the cake (though I enjoyed the scraps!). Place all of the circles on another baking tray. If you like, color your frosting—I added pink to mine but you can choose any color, of course. Scoop about half of the tinted frosting into a disposable decorating bag or zip-top bag. Twist the top closed and secure with a rubber band. Snip 1/2 inch from the tip of the bag and pipe a circle of frosting on each circle of cake. Don’t worry about being perfect, these can look plenty messy and still be awesome. Sprinkle the rainbow sprinkles on the frosting as you go along. If you run out of frosting, open up that second container and color some more. As the frosting sets a bit, prepare your sticks. Even with baking a thinner cake, the circles and frosting are pretty heavy, so you can’t just stick them on a stick without the whole lot sliding down. If you’re just serving the kabobs on a platter, then you don’t need to worry about the sliding as much, but preparing the sticks makes displaying the kabobs and holding them to eat so much easier. So here is my MacGyver-like trick: Skewer a mini cupcake liner and slide to the top of the stick. You can point the skewer any way, but I like the pointed end on the bottom so no one takes a bite into the sharp end. Take a strip of duct tape about 5 inches long and wrap around the stick 2 1/2 to 3 inches from the top. (So there is about 2 ½ to 3 inches of bare stick above the duct tape.) Rest the cupcake liner on top of the duct tape. And now you can assemble your kabobs. Hold a circle of cake at the sides and carefully slide on the stick, gently pushing down into the cupcake liner. Repeat with two more cake circles. Place the kabob on its side on a baking tray and finish assembling the rest. Store in the refrigerator until you’re ready to serve. If desired, display standing in a foam block.